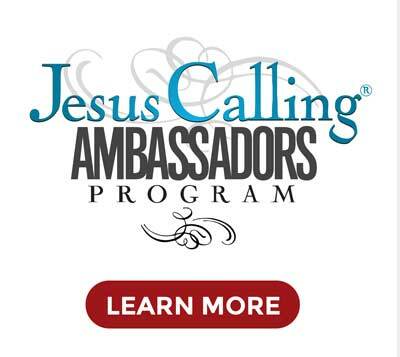 Welcome to the Jesus Calling Podcast. Today we talk with two women who channel their artistic gifts into messages of hope that they use to inspire the world: country music star RaeLynn and Christian writer Kristy Cambron. RaeLynn believes in the power of music to tell stories and help others who are struggling feel they are not alone. 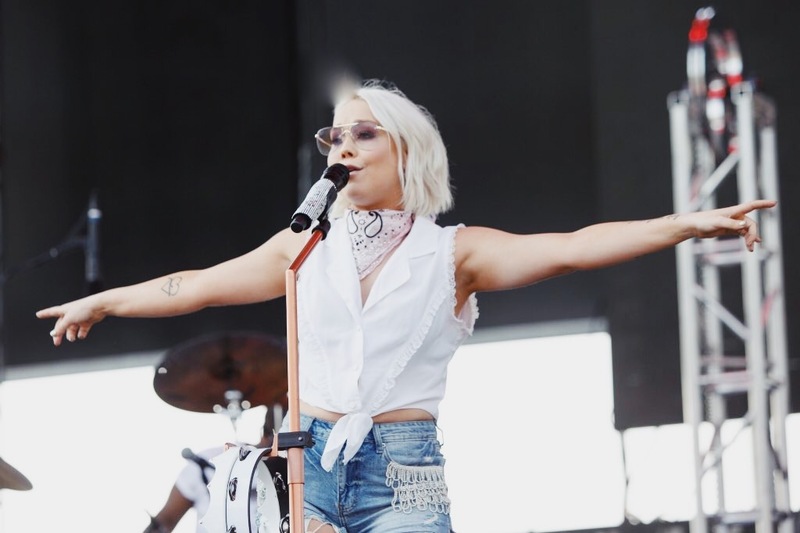 After she was a contestant on NBC’s The Voice in 2012, RaeLynn saw her career skyrocket. Today she shares how her passion for music was born in church, the winding road she traveled to launch her music career, and how God has helped her overcome personal and health struggles. Since she was a child, Kristy Cambron has loved telling stories. 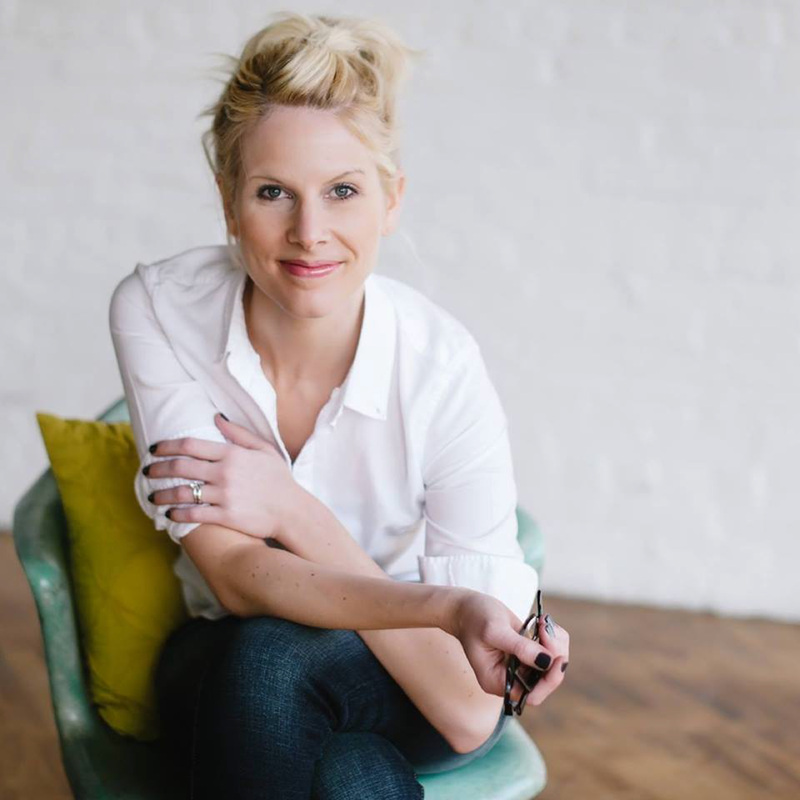 She tells us how one art history class in college inspired her to write her first novel more than a decade later, why she decided to quit her Corporate America job after 15 years and begin writing books, and why a book on her desk at work inspired her to make that leap. Narrator: Welcome to the Jesus Calling Podcast. Today we talk with two women who channel their artistic gifts into messages of hope that they use to inspire the world: country music star RaeLynn and Christian writer Kristy Cambron. 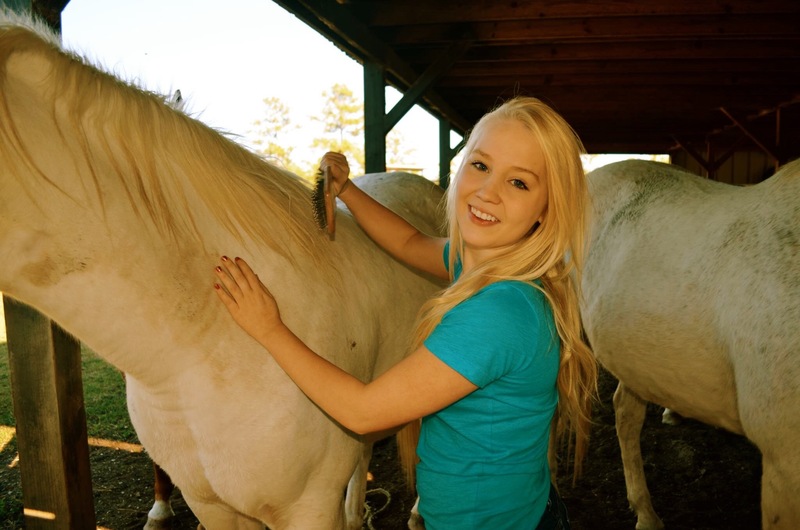 First, we visit with up-and-coming country music star RaeLynn. 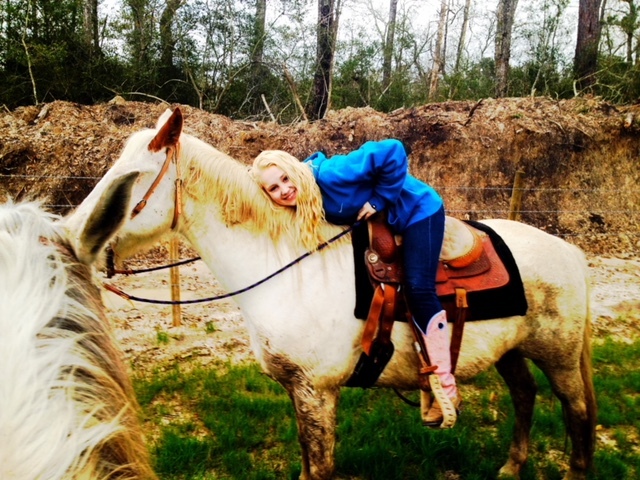 After she was a contestant on NBC’s The Voice in 2012, RaeLynn saw her career skyrocket. She believes in the power of music to tell stories and help others who are struggling feel they are not alone. 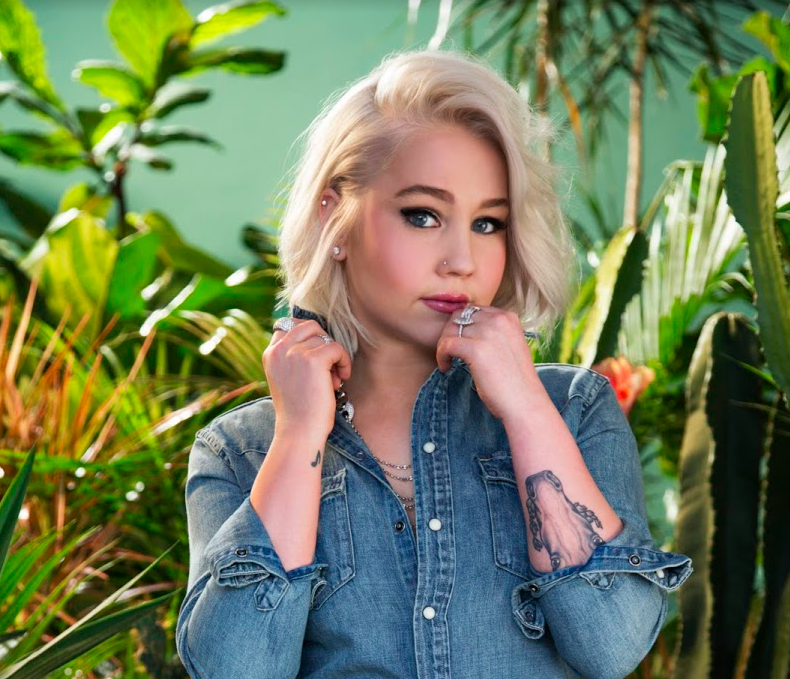 RaeLynn shares how her passion for music was born in church, the winding road she traveled to launch her music career, and how God has helped her overcome personal and health struggles. RaeLynn: Hi, my name is RaeLynn, and I am a country artist. I grew up in Baytown, Texas, which is outside of Houston, probably 45 minutes from Houston. I grew up in a very musical family. My aunt and my uncle are pastors of a church in Baytown, and my mom is the person under them and kind of helps with things around the church. Growing up, I was involved in everything at the church. They threw me on whatever instrument they needed that Sunday, I guess you could say. I helped figure out what songs we were going to sing. I remember there were some Sundays where I played drums, which is funny because I’m a little 5’2 blonde. And there were some Sundays where I would just sing or do whatever my aunt wanted me to do. I went to public school till I was in sixth grade, and then I started homeschooling. That’s when I was at the church full time, and then I was doing my own music stuff as well. I always knew that I loved music. I grew up coming to Nashville all the time. My cousin was in Christian music. His name is Leland, and he’s in the Leland Band. They’re awesome band, and all their albums were nominated for GRAMMYs. My cousin Leland actually got a publishing deal, so he started writing songs at 13 years old, which is crazy. After he got his publishing deal, we would come up [to Nashville] all the time for GMA week. I would help sell Leland’s merch and help him as he got older. That’s when I remember walking down Broadway, taking pictures with Elvis and all of that, when I was super young. I’ve always loved Nashville. There is always something that drew me to this town, but I didn’t know that I would be called to country music. It just kind of happened. When you are in Texas, there’s nothing much more to do than to go to church and listen to country music. And every year, I would go to the Houston rodeo, which is the big rodeo in Texas. One year I saw Alan Jackson, one year I saw Hilary Duff—oh my gosh, that’s a throwback. One time I saw Blake Shelton. I’ve seen Miranda there. I’ve seen George Strait there, like, every year we would go. So I kind of credit [the rodeo] to giving me the entertaining bug when it comes to country music, and just how much country music flows through Texas. Narrator: At just 17, RaeLynn’s career began to take off, thanks to her appearance on NBC’s The Voice. RaeLynn tells us why she was almost unable to audition for the show. RaeLynn: I was coming back and forth to Nashville with Leland at first. Then I had a connection to write songs with some writers out here in Nashville. Leland’s brother Jack is married to Michael W. Smith’s daughter, Whitney Smith. I would stay with them, Michael and his wife, at their little guest house. I would just come up here to write whenever I could. I think I was 16 the first time I came, or just turned 17. Then I went and I made it. And I felt so good because I was like, I don’t want to have to go out and have to face that guy. The first time I sang, they played my audition right after the Super Bowl. There were 13 million people watching that episode, 13 million. I’ll never forget being on my laptop. I had 200 followers on Twitter, and I got 10,000 followers in an hour. It was just nuts. It was, like, overnight just completely crazy. And the only thing that got me through was the peace of the Lord. I was super young—and I’m still young—but when you don’t have anything to compare anything to, everything’s just kind of open ended. I didn’t have any fear in my heart because I’d never done anything like that. I remember mom would pray over me every night that God would just give me confidence on stage, and that I would just go up there and be alive for Him and just do great. I credit my mom and my family’s prayers every day. It’s so funny when I watch old videos. I was fearless, and I still am fearless. But when I think back on it, I’ve sang on The Voice a couple of times since then, doing my own songs, and I get so nervous because I know how big the show is now, and I didn’t know then. When I first moved to Nashville, I was looking for a daily devotional to kind of jumpstart my day. I wanted a devotional to give me scriptures each day that I could study more. And so when I found Jesus Calling, it was really awesome because first of all, I feel like every day it hits me like I need it to hit me. It’s just so crazy. That’s how I know that each one of those [devotions] is from the Lord, because each day is like, “You’re probably going to face this, but know that I’m with you.” On those days, I always get faced something, and it’s just so crazy because that book is just so anointed and so incredible. But then the scriptures at the bottom, I’ll always look them up in the Bible, and I read just that whole chapter. [Jesus Calling is] always giving me kind of a footing and a way to read the Bible each day. And since then, it’s been it’s been a lot easier for me. At first, it’s like the Bible is just so intimidating. It’s so big, and you kind of don’t know where to start. Growing up in church, of course, like each Sunday it’s different. But I wanted to have my own walk with the Lord by myself. What does that look like? My first stepping stone for that was Jesus Calling. Narrator: RaeLynn reads a message that is meaningful to her from the June 21st entry of Jesus Calling. Wait patiently with Me while I bless you. Don’t rush into My Presence with time consciousness gnawing at your mind. I dwell in timelessness: I am, I was, I will always be. For you, time is a protection; you’re a frail creature who can handle only 24-hour segments of life. Time can also be a tyrant, ticking away relentlessly in your mind. Learn to master time, or it will be your master. My favorite part about country music and the reason why I wanted to be in this genre is the stories that you can tell. I believe that music is a way to heal people in a lot of ways. And some of the toughest times in my life, I can tell you what record and what song helped me get through it. I think it’s super important as an artist to speak your truth because that’s all you can do. If I’m going to sing a song every night, it’s going to be something that I’ve went through. So “Love Triangle” is a song that I wrote right when I got was done with The Voice and I came to Nashville. Honestly it was just a song that came from heaven. That song has had magic on it from the day we wrote it. And it’s so funny, because even though it’s about divorce, it has helped so many people. I met this woman, and she heard this song. She was thinking about getting a divorce because her husband was going through a lot of things. And after she heard me sing it at a writer’s round, she decided right then and there to make her marriage work. I loved being able to go back and see songs that changed my life. And to know that “Love Triangle” is one of those songs for people, and even [for] kids that have felt stuck in the middle between their parents. This one girl I met in a fan meet-and-greet said, “I’ve never known how to explain to my parents how I felt about being stuck in the middle. So all I did was give them your ‘Love Triangle’ song and say, ‘This is how I felt for the last 15 years.’” And literally it gives me goosebumps. I still say that because that’s what music’s about. Sometimes you can’t talk about things, but you could always just play it for somebody. And I don’t know, I just thought that was a really cool story. Narrator: RaeLynn is passionate about spreading a message of love and service to her fans. She talks about her new single “Queens Don’t” and the real-life inspiration behind the song. RaeLynn: First of all, I don’t believe it’s just a song for a woman. I believe it’s a song for men and women. Somebody who really has a heart of royalty is somebody who truly loves somebody for who they are, and they act with a heart of humility, and they serve other people. I think about my mom. My mom is the biggest queen of ‘em all. One thing that I love about my mom is she’ll go into a room, and if someone’s not feeling the best about themselves, when she leaves they’ll always come up to me like, “Your mom just rejuvenated my spirit.” And that’s what being a queen and a king is. It’s going into a room or going somewhere and just completely captivating somebody and making them feel like a million bucks. That’s what I know that I’m called to do. Each fan that I meet, I don’t take any of it for granted. I want to look them in the eye and thank them for coming to meet me, and I want to thank them for buying my records and thank them for buying a ticket. Because if it wasn’t for them, I wouldn’t be here. And so you only get those moments [once]. What if I never meet that fan again? I want to make sure that they’ll always remember that moment. 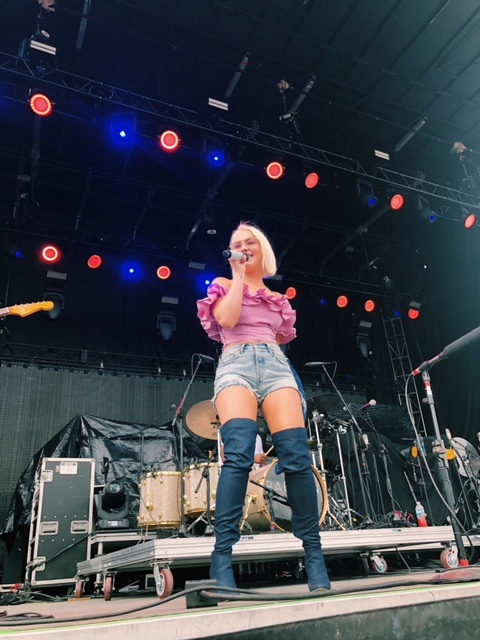 Narrator: Though she has experienced big success on the stage and the country charts, RaeLynn is open about the struggles she faces in her personal life and her health. Raelynn: So me and my husband met at church. Clearly I wasn’t focusing on the Lord that day and was focusing on him. And then I saw him a couple of weeks later at a wedding, and he got my number. We’ve been kind of just stuck at the hip since then. I was 18, he was 21, and we got married. [In the] two years we’ve been married, he’s [joined] the Army. He decided to join probably about a year into our marriage. And it’s a selfless thing what he does, and I’m very honored to be by his side. He supports me in everything that I do, in music and as an artist and as a woman. I think it’s super important as a wife to do the same for him. It’s hard for me, because Josh has gone to training and stuff. But it really shows me, I think, it’s easy for anybody to be selfish and say if he was doing another job, he could come see me and come out and be on road with me. But when I think about it, I’m like, “All I’m saying is me, me, me.” And that’s kind of selfish. I’m so thankful that he has all these dreams in his heart, because that’s what’s going to make him so unique to this world. And just like I have a calling on my life to do this, He has a calling on his life to do that. But I went to a lot of classes, and I learned really about this about type 1 diabetes and this disease. I quickly realized that I can either be upset about this and live and very unhappy life and like kind of walk like, “Why, God? Why did you give me this?” Or I can take the bull by the horns and take this disease and just kind of make it. There’s no reason that this has to hold me back, and that’s the approach that I took. I will say, it took me a while to get there. One thing that I credit my diagnosis with is that with having type 1 diabetes is I live the most healthy life right now. I credit that to my diabetes because I think if I didn’t have diabetes, I’d be eating donuts every day. Like, honestly. I love food so much, and it’s helped me really just take care of myself. So anytime someone throws a wrench in your plans and you think life’s going to be this way and it kind of takes a U-turn, just know that happens for a reason. You can always get back on track. Now I’m so thankful I have type 1 diabetes because I can be a voice for it. And it’s a part of my story that that only I can have, which I think is cool. I’m reminded every day when when I see things happening in my life that, gosh, I would not be here if it wasn’t for God, and what He’s done. It’s a calling for me to do this. I loved the way he answered that because it’s so true. Everything that I have is because of the Lord, and I know that. I wouldn’t have my career if it weren’t for the promises that He’s given to me. Things that have happened in my life literally wouldn’t have happened without the favor of God. And I know that 100 percent. Narrator: To learn more about RaeLynn’s new single “Queens Don’t” and about the RaeLynn Diabetes Fund, visit raelynn.com. We’ll be right back after we discuss something new from Jesus Calling. Narrator: Our next guest is Christian fiction and Bible study writer Kristy Cambron. 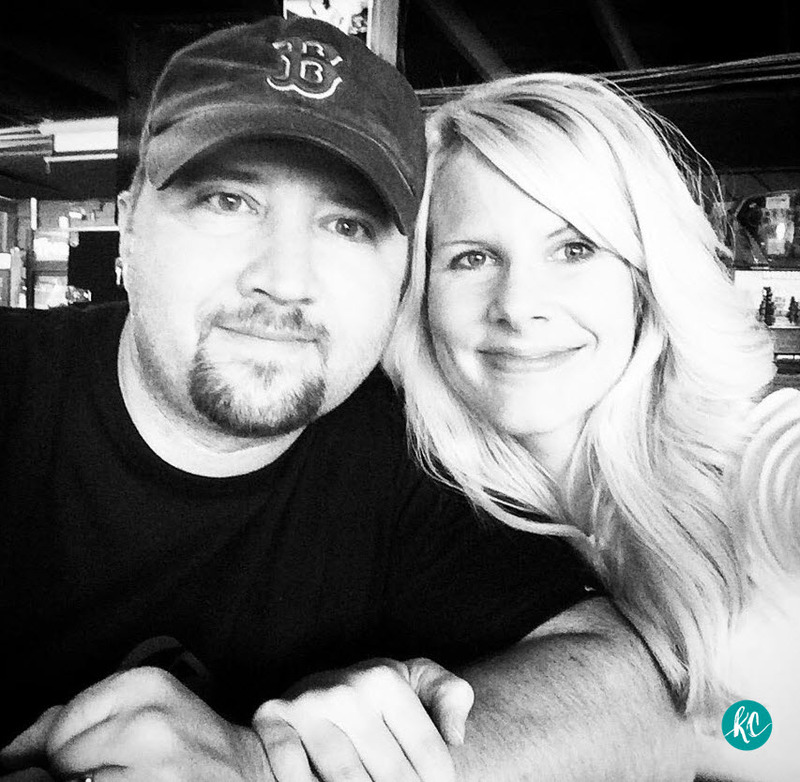 Since she was a child, Kristy has loved telling stories. Today she tells us how one art history class in college inspired her to write her first novel more than a decade later, why she decided to quit her Corporate America job after 15 years and begin writing books, and why a book on her desk at work inspired her to make that leap. Kristy Cambron: I’m Kristy Cambron. I’ve been married to Jeremy for 17 years, but we’ve been best friends for 21. 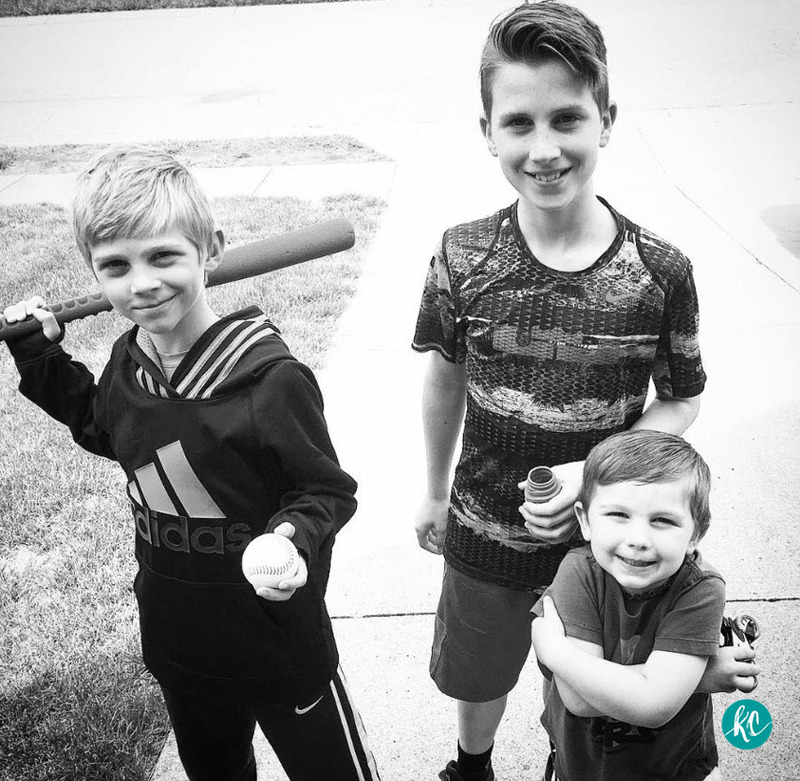 We have three little boys, which means I’m also a mom. And I’m a vintage-inspired storyteller for Thomas Nelson Publishers. I write fiction, I write nonfiction, and I love talking about Jesus. All of my stories, anything that I write whether—it’s fiction, a nonfiction Bible study, or when I’m speaking onstage—whatever I write is in this space where art and history and faith merge, where those three things come together. That’s always where I want to be telling a story. I’m a Midwestern girl at heart. My dad was an architect, so we had to travel around to wherever the jobs were. I spent time in Illinois, Michigan, Ohio. Settled in southern Indiana, which is really cool because we have this northern thing going on, but we have some Southern culture too. We say “y’all,” we sound a little southern because we’re right by Kentucky. I spent time in church as a kid, and was brought up in the Southern Baptist Convention. But I would say this big faith factor for me and my family came from the relationship that my mom and my maternal grandmother both had with Jesus. My mom led me to faith in Christ very young, and my grandmother instilled that faith in my mom. My grandmother is known as this woman has spent her life praying. She’s in prayer in and day out. It’s amazing because I’m in my upper-30s now. And every day of my life, I have been prayed over by name by my granny, who’s still here, who’s still on Earth with us. Getting saved as a young kid is very different from walking an aisle at 16 years old in youth church and and understanding that what Jesus did saved me from my sin—that He went to the cross and died for that sin and rose again. The redemption, the offer of a free gift, and a best friend that was just waiting for me—that became real to me when I went to a Christian school in high school. So 16 years old was really where I understood who Jesus was, what He did, and who He wanted to be in my life. All the way back, maybe five years old, I would tell my mom at the time, “I want to be a Disney animator.” I just loved visual storytelling so much. And what do you have when you were a kid? You have cartoons. The gold standard back when I was a child was Disney animation. But the funny thing is, I had these hands that were not gifted to be an artist. I couldn’t really paint, I couldn’t draw really much on stick figures, couldn’t sculpt. I thought that meant I couldn’t be an artist, that I couldn’t create. And the dream to be a visual storyteller, it could have died right there. But my mom took my sister and me to the library every week in the summertime when I was young. And my sister, she is still the biggest reader you will ever meet. It’s funny because I write books, and she reads them, she tells me about them. But my sister would run to the fiction section of the library, and I would go the other way. I would go to the art section. And even as a kid—seven, eight, nine years old—I would pull down these thick volumes of art history and Disney animation. And I remember sitting on the floor in the library, just thumbing through the pages and falling in love with visual storytelling. Now it wasn’t until I went to my first year of college—and I’m young, I’m 17 years old—and I walk into an art history classroom, and all of a sudden it’s where those things that I loved—the art, history, and the faith—where those things came together. And I hear this whisper on my heart and knew it was the Holy Spirit telling me, You’re home. This is where you’re supposed to be. That was when things really began to change for me, where I really began to understand my creative calling. Yes, I got an art history research and writing degree because it was my passion. It was my heart. But I had no idea at the time that God was going to take that experience, and more than a decade later, He’s going to have that emerge in creative writing and writing my first novels. And so faith and creativity and art, they were always really connected with me. I just had to begin to understand what my calling was to those things and where they merge together. One of the things that I really remember from those first classes in art history: there was a day that I walked in and there were all these students. It was before social media, it was before all the technology. So we literally had slides that you would have projected onto the front of this large classroom. And so I walk in, and our art professor, she begins to put slide images on the wall. And I could tell, Okay, this is World War II era art. I could tell that it was some beautiful things. It started out to be music notes, flowers, and landscapes, really just beautiful watercolors. There were there were some poetry, there were beautiful images. And then the images began to take a darker note. They became more menacing. And you would see guards, and watchtowers, and boxcars, train cars. You would see people marching in line, in striped uniforms, and so we knew this was Holocaust Art. But we thought it was a commentary on the art. We thought this was modern art. And that, for me, imprinted on my heart. It was a defining moment for me as a creative because years later, I had no idea that God was going to have my debut novel be about the art of Auschwitz. But it really imprinted on my heart because I was thinking about how creative our God is, right? All of the things that he Has designed on this earth—it’s nothing, if it’s not creative. I remember thinking, Under penalty of death, in the most horrific circumstances we can imagine on this earth, those prisoners in those concentration camps were willing to risk everything because God had put creativity on their heart so strong that they were willing to risk everything just to create. That was a heart thought, an idea that stayed on my heart for more than a decade and would eventually come out in my debut novel. I do write novels where you have arts and history and faith and where those things collide, but it’s more than that. It’s taking these dark places in our world history, in our humanity, and seeing that the light and the love of Christ is able to rise up in the midst of all of those. Narrator: After college, Kristy spent 15 years working in Corporate America as a group instructor and technical writer. Over time, she realized she wanted to pursue work where she could talk to others about Jesus and His love. 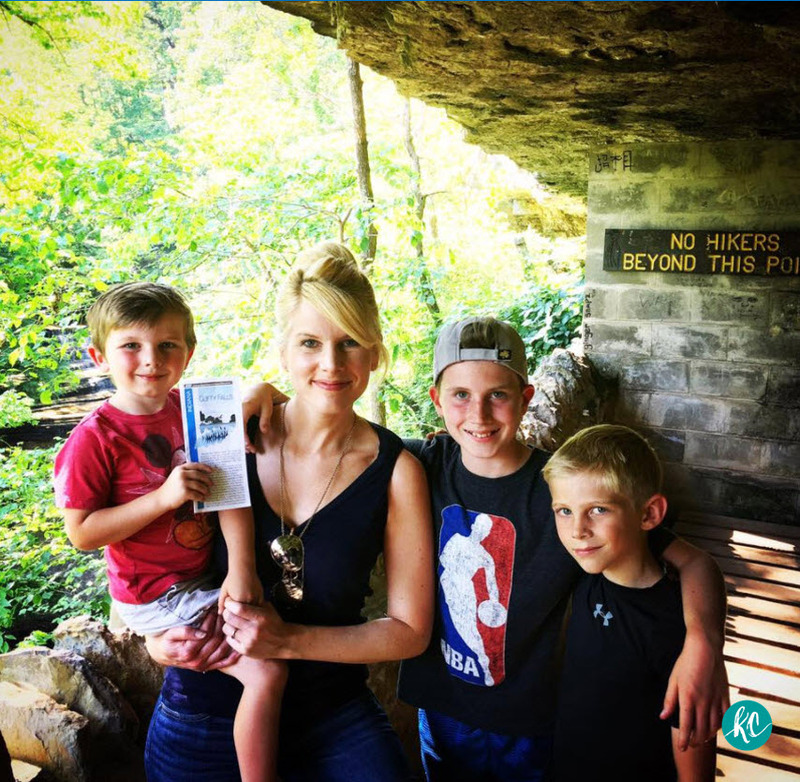 Kristy recalls the tug on her heart to pursue work that was more meaningful to her, and tells us how a gift from her mother played a huge role in that move. I first became aware of Jesus Calling through my mom. My mom has been a great faith influence in my life, and I’m holding a book that she gifted me, a Jesus Calling book, on Easter in 2010. And this was this book, years ago, when I was sitting at my desk at work, and I felt God begin to nudge me into my calling, and that was creative storytelling with Him. 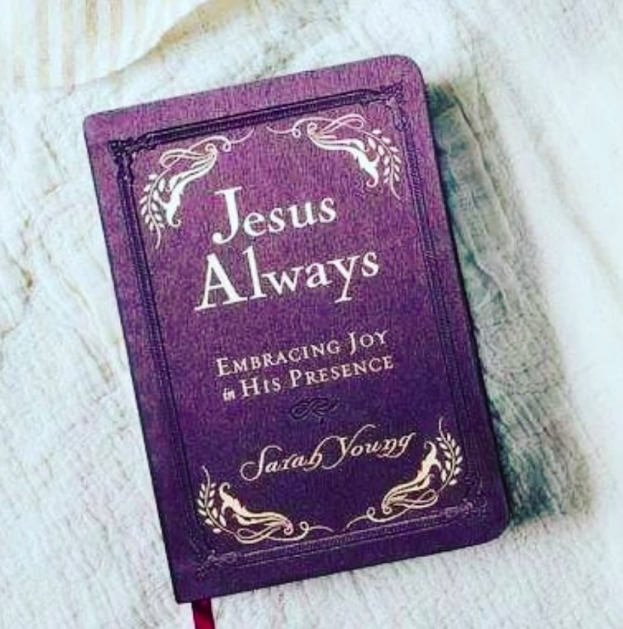 It was that experience of opening the book and finding through Sarah Young’s words just the beauty of the words on the page that I had a connection to God. I had a connection that was personal, it was intimate, that He knew me. He knew my experiences. He knew my dreams. He knew my future before I even did. And to find that on the pages of a book, it’s so rare. Jesus Calling is just ever present. It’s been there for years, and I love that I have the opportunity to dive into these words as many times as I need to on a daily basis to enrich my walk with Him. I remember sitting at my desk, and I’m looking out over Main Street. These cars going by my really busy skyscraper office. And I had this copy of the Jesus Lives version of Jesus Calling on my desk. It talked about your calling and depending on Jesus and how He’s there. And the verses 1 Peter 2:9, Isaiah 61:10—I’m just sitting at my desk and I’m reading over these verses. I’m really feeling this call on my life, that God was asking me to do something radical which is trust Him with everything. Surrender everything to Him. And it was a couple of years later that He began to press upon my heart to go for publication. A girl from small-town Southern Indiana who sometimes got B’s in English was going to go write books, write stories for God. I am as surprised as you are, but God was right there, and He was there in this book. I have dates written in the margin of how that calling was right there. And so my mom gifted me this book, but she had no idea that through this book, she was gifting me to my calling. And that is highlighted, “Stay connected with me.” This page is dogeared, and I have dates in the margin because it really spoke to what I had done for so many years, which was sleepwalking in my faith with Jesus. And after this 15-year stint in corporate America, I really felt that I began to use my spiritual eyes maybe the first time. I’d known Jesus since I was 16 years old, but I really wasn’t walking with Him. But I wanted to, and this book really helped me to remember to stay connected with Him. I’m asked often what was that first step out like, to step out in order to step into your calling with Jesus. And it’s been about five years now, and I wish I could go back and talk to that girl five years ago and say, “The big moment is not in the step-out. It’s not in the jumping out to a new story road.” I thought it was. I thought, Okay, God, you’re asking me to walk away from security. You’re asking me to walk from comfort, from part of my identity. I didn’t even realize part of my identity was wrapped up in who I was, what I did, what my titles were. I had no idea that I was on a completely different road than He wanted me to be, which was to find my definition in who Jesus says I am. That’s it. And so to step out, I thought the big moment was, Okay, God, I’m going to walk into this office and put in my two weeks notice. And it was huge because I wasn’t doing this alone. I had my husband. I had three children. I had family. I had friends supporting me. And I remember the call was so firm on my heart that God was telling me, “Step out, step out,” and I wouldn’t go. I was too scared to go. And I went in the next day and I gave my two-week notice. And I thought that was the big thing. Yes, we did it! We did the big step out. No. The call was never just to step out. Okay, I’m going to fall into becoming an author, which had always been part of my dream. It was so much more than that. It was falling in love with Jesus and being willing to surrender everything to Him for the first time in our family’s journey. To be able to imagine ourselves walking a different story road, a new journey perhaps, it really is what I love about storytelling, whether it’s a fiction book, whether it’s Bible study, because that stuff is all true, right? I heard this years before—and I’ve never forgotten it—that the Bible is the only book that, when you read it, the author is always there with you. How incredible is that? And so to be able to imagine what life was like back in, say, first-century Rome and the church was just getting started, when Jesus was on earth and He’s walking that story road with the disciples—it’s more than just opening a book and thinking, Wow, He was a great teacher, or, He was a cool guy in history.” It’s so much more than that. It is literally sandals in the dust, walking step by step with Him, day in and day out. That imagination is how the Bible comes alive, and it comes alive to us right now today in this world we are living in. And it doesn’t matter if I wake up and I’m going to an office, or I’m a homeschooling mom, or I’m going to church, or I’m doing ministry, or I’m volunteering. Whatever that space is, whatever that sphere of influence is that God has placed me in my life, if I can imagine what the context of Scripture is, if I can imagine living another’s story, there’s really nothing that I can think that would get me closer to God, that would help me to understand Scripture and to live it out day by day by day. 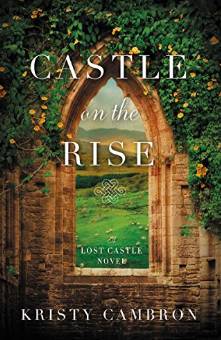 Narrator: To learn more about Kristy’s novels and Bible studies, as well as her latest book, Castle on the Rise, visit KristyCambron.com. 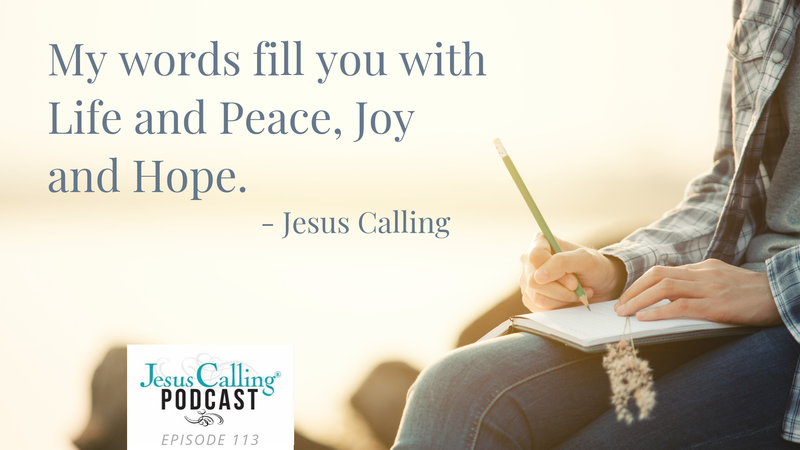 Narrator: Do you love hearing great stories of faith each week via the Jesus Calling Podcast? We want to hear from you! 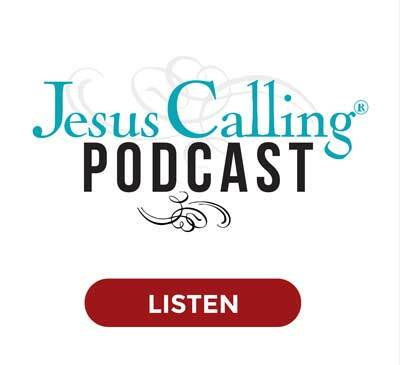 If you haven’t already subscribed to the Jesus Calling podcast, visit the Jesus Calling page at iTunes.com and hit the Subscribe button. While you’re there, we’d love for you to leave us a review and tell us how you feel about the show and what future guests you’d love to see. Your reviews and subscription help us share these stories of faith with more people who need the hope and encouragement of Jesus Calling. If you have your own story to share, we’d love to hear from you. Visit jesuscalling.com to share your story today! Warner-Tamerlane Publishing Corp. (BMI)/A Girl Named Charlie (BMI) / Round Hill Songs Jimmy Robbins and Extraordinary Alien (ASCAP) / Super Big Music/Prescription Songs/I Take The Bull By The Horns Publishing (ASCAP). Reprinted by permission. All rights reserved.